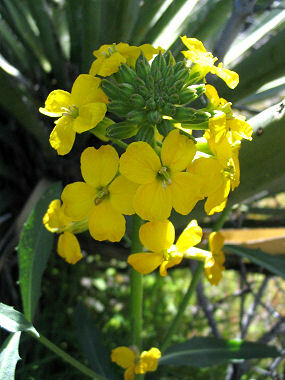 Western Wallflower is a member of the Mustard Family. The plant grows to 32 inches in height and has grayish-green, lance shaped leaves with small teeth along the margins that grow to 5 inches in length. The plant typically grows along roadsides and on open slopes and flats at elevations between 2500 - 9500 feet. The Western Wallflower at right was photographed in the Superstition Wilderness beneath a yucca. Western Wallflower blooms between March - September and produces bright yellow flowers with 4 petals to 0.75 inches in width that grow in a cluster at then end of a stalk. Flowers are followed by a slender 4-sided pod to 4 inches in length.